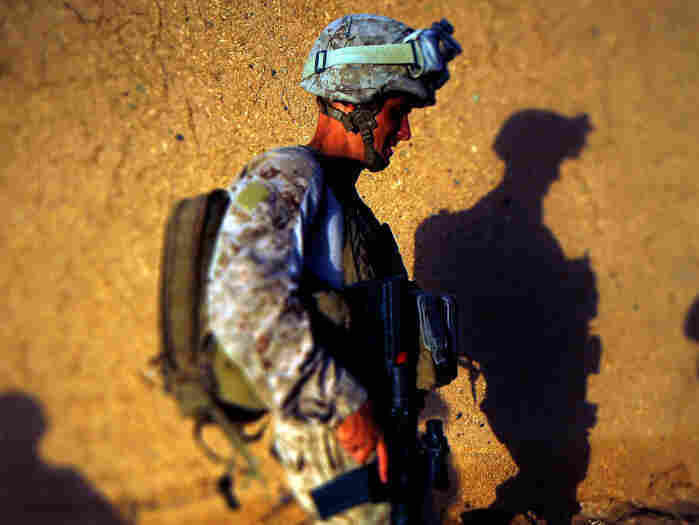 As Wars Drag On, U.S. Interest Wanes There was huge public support for the U.S. war in Afghanistan when it began a decade ago. Today, only a quarter of Americans follow it closely. When U.S. forces launched the war in Afghanistan on Oct. 7, 2001, they were riding a wave of anger and a call for justice by a broad swath of the American public. 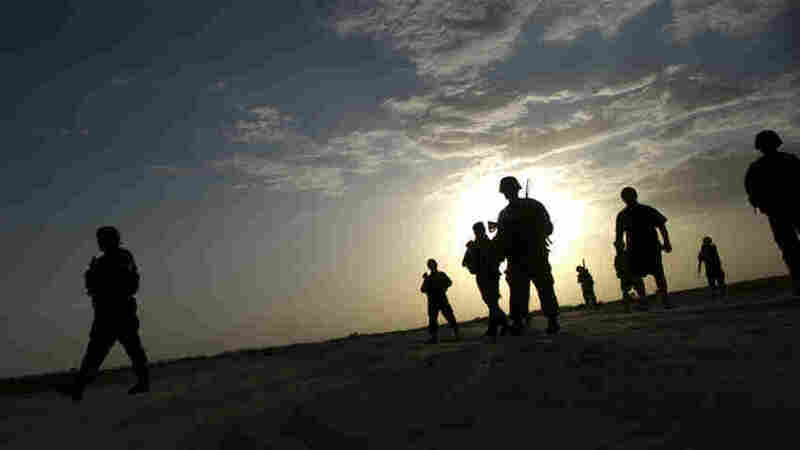 Andrew Kohut, president of the Pew Research Center, says the initial support for the Afghan invasion was around 90 percent, and the war was closely followed by a large number of people. But since then, the public has been slowly disengaging, he says. In 2001 and 2002, about 40 percent of the public said they were following news about Afghanistan very closely. From 2009 to 2011, that number had fallen to 25 percent, Kohut says, adding that the pattern in Iraq was the same. Kohut says he's not surprised by these numbers. The public is typically more engaged at the start of a military operation. But he says the support and interest in the Iraq War started to tumble within months after it began in March 2003. Darryl St. George, a Navy corpsman, walks along a mud compound wall in Helmand province, southern Afghanistan. Next month will mark 10 years for U.S. forces in Afghanistan. "The public soured on the decision to go to war in Iraq by 2004, when not only were there no weapons of mass destruction found, but all of a sudden, the cost of that war began to increase, [and] casualties began to be rather substantial," he says. Army Col. Matthew Moten, a professor of history at the U.S. Military Academy at West Point, says it's unrealistic to sustain public interest on any issue year after year. Moten says the American public has obviously moved on from the two wars. "I think that the public has other issues on its mind, collectively — namely the economy, jobs, the problems with the federal deficit and debt," he says. "And those seem to be trumping concerns about the war for most of the populace." Christopher Preble, vice president for defense and foreign policy studies at the libertarian Cato Institute, senses public frustration over the limited achievements after years of war, hundreds of billions of dollars spent, and the loss of more than 6,000 U.S. service personnel. "There's a sense in both of these wars, the nature of these wars, you're not expecting a heroic victory of the sort we came to expect from wars like World War I and World War II," he says. There's a sense in both of these wars, the nature of these wars, you're not expecting a heroic victory of the sort we came to expect from wars like World War I and World War II. Moten says only a tiny fraction of the American public is actually involved in either war. He says people would likely be more interested if they had to shoulder some of the responsibility and make more sacrifices. "I call that having skin in the game," he says. "If America had a draft at the moment, even a very small draft, if mothers and fathers knew that there was some real chance that their sons and daughters might be conscripted into the military, I think they would pay a great deal more attention to what's going on in Iraq and Afghanistan." But it's not just the public that has lost focus on the wars. Many cash-strapped news organizations have scaled back or even eliminated their coverage. And the two conflicts barely cause a ripple on the campaign trail, especially among Republican presidential candidates, says Preble. "Many Republicans don't want to call attention to Iraq," he says. "That would remind the American public that they were, in fact, the cheerleaders for this war that most Americans now think was a horrible mistake." Preble says the war in Afghanistan is more complicated, because it's still seen as crucial to counterterrorism efforts. But that doesn't guarantee a greater interest in the conflict, even though 100,000 U.S. troops are still fighting there.